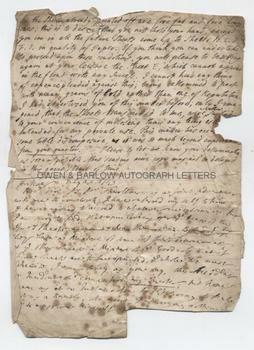 WILLIAM BOWYER Autograph Letter Signed. English printer and antiquarian. Known as 'the Learned Printer'. ALS. 1p. Antwerp. July 23rd 1743. To Mr Tunstall. Integral with Tunstall's letter to William Bowyer regarding his edition of Cicero. 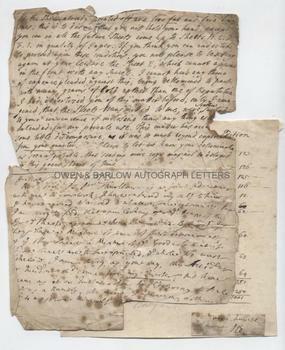 William Bowyer has appended his reply, from which his signature has been clipped and attached to an autograph printer's account for the editions of Anson's Voyages. Both items are sold together. The handwriting of William Bowyer has defeated us in places but the substance of the letter is as follows: "Good Sir, As Mr Thurlton is a joint adventurer with me in your work, I have referred myself to him and have agreed to acceed to whatever he determines. But I am sorry to find that upon looking over [. . .?] of the good sheets, as you reckon them, viz B, C, D, F, I they have a mixture of paper of that browne cast and of other sheets a mixture of the good, so that if five sheets are to be reprinted the whole ten must or [. . .?] would come from my quarter but hope you mean as an instance of a Fool's going to [. . .?] not as a [. . .? ], who meant I assure you, nothing of yrs to [. . .?] himself." Tunstall in his letter to William Bowyer complains that of the sheets already printed there are "five fat and five lean ones". He says that he would rather "part with many grains of gold rather than one of reputation". He talks of his discomposure and asks that the sheets be reprinted. 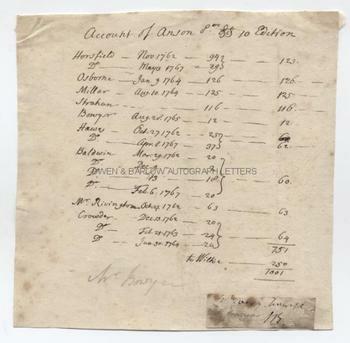 The document dealing with the revenues from the printing of Anson's Voyages shows that William Bowyer received £12 for his edition of 28th August 1765. It also lists other printers, with dates from 1762 to 1767 with sums paid. 4to. Approx 9.5 x 7.75 inches. Creases and edge tears, with an old paper repair to verso. Some foxing. Good. William Bowyer was the leading printer of his generation, being both printer to the Houses of Parliament and the Royal Society. He published many of the eminent authors of the day and is also known for his printing of The Domesday Book that was left unfinished at his death. He was a fellow of the Society of Antiquaries. Provenance: John Nichols (1745-1826) printer and antiquary. This autograph was contained in an early 19th century album (pages watermarked 1814), the first page of which has the laid down inscription "These autographs were collected by my youngest daughter Anne Susanna. 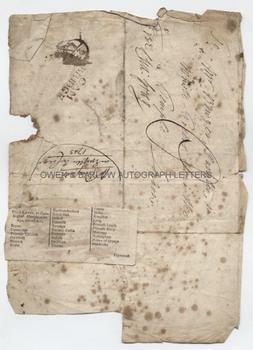 J.Nichols Oct 29th 1813". John Nichols was apprenticed to William Bowyer in 1759 and went on to succeed him in the business. Nichols was also the literary executor and biographer of William Bowyer and published his 'Anecdotes of William Bowyer and his Literary Friends' in 1782.